Good news travels fast on two wheels. For the past eighteen years, inmates at Mike Durfee State Prison have been restoring old bikes in a huge workshop – tearing them apart and rebuilding them, a metaphor for what they hope to do with their own lives. Broken bikes are brought in by the hundreds each year to the South Dakota Department of Corrections for its program, called Pedal Power from the Pen. After each bicycle is neatly repainted, repaired, and reupholstered, they are given away at the end of the year– more than 1300 bikes– to underprivileged children around the state of South Dakota. 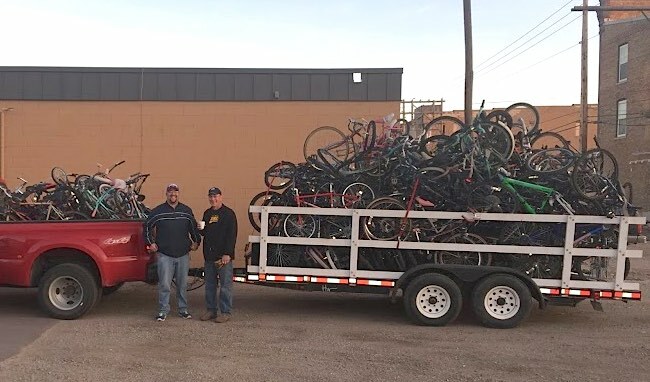 For the past decade, the police department in the city of Mitchell, alone, has regularly contributed 100 unclaimed or abandoned bikes every year. With all sizes available, some are distributed to children of inmates who have no wheels of their own. Most are given back to law enforcement agencies or social service groups at an annual dinner, ensuring they end up in communities that need them most.